Hampton Roads Hounds for Heroes is a non-profit, Portsmouth, New Hampshire-based organization created by retired veterinarian, Linda McAbee. The organization transforms shelter dogs into lifetime companions for veterans, saving the lives of both simultaneously. 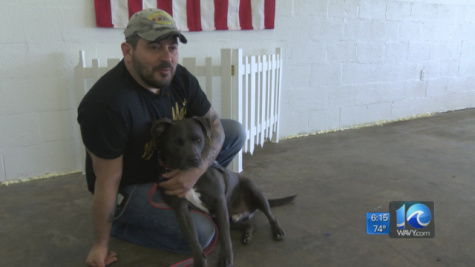 Hampton Roads Hounds for Heroes made news recently for its first gift of Malec, a three-year-old,specially trained, Pit-Bull mix to veteran Petty Officer First Class Robert "Smokey" Adams. Post Traumatic Stress Syndrome (PTSD) can be a lonely affair and it demoralizes and emotionally cripples its sufferers. Petty Officer First Class Robert "Smokey" Adams spent 23 years in the military, first as a marine and now as an active-duty Navy corpsman serving at JEB Little Creek-Fort Story. He endured some terrible times over the last decade after serving three deployments to Iraq between 2004 and 2006. McAbee was determined to help Adams and others like him. In her own words: "I told my family that if I could take my retirement and save the life of one veteran and one dog I'd be totally happy." 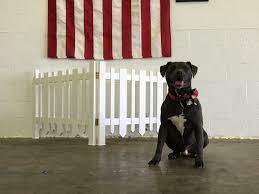 Malec is the first success of Hampton Roads Hounds For Heroes, a start-up financed with funds from McAbee's own pocket. She spent more than $140,000 to launch the non-profit so close to her heart and more than $18,000 to train the dog. Malec can help with both everyday small tasks, such as turning lights on and off, and filling larger, emotional needs like serving as a constant companion and nurturer to a soldier who served his country well but lost his way readjusting to the civilian world. His path arduous and challenging, but at its end is the comforting realization that the enemy lies within his wounded spirit and not out there in front of him. The service dog offers unconditional love and reassurance that the world can be a good place again. Hampton Roads Hounds For Heroes serves a dual purpose, which makes it doubly significant. In McAbee's own words: "We're taking dogs out of the shelter and naming them after a deceased veteran who has already lost their battle with PTSD, so they are going to be a living legacy to hopefully save someone else." For Adams, Malec has reopened the door to a world that had been smothered by the priorities of survival within a deadly war zone and almost entirely lost. Floundering with the inability to perform innocuous civilian tasks, however small, hurled him even deeper into the tormented vortex of PTSD. According to Adams: "A lot of people don't realize that being in a combat zone is actually a less stressful environment after you've done it a couple of times. You come home and now you have to answer the phone, reply to e-mails and pay bills." This special service dog has sensory abilities that may seem extraordinary. According to McAbee, "Malec can sense minutes before his owner is going to have a meltdown. He knows it. He will stop whatever he is doing and come over and make sure that Adams is paying all of his attention to him." The power of love is encapsulated in Adam's own words about his loyal, furry companion. "A lot of little things can bring you down and get you a little upset...I can just look at this dog and it puts a smile on my face." Here's to many smiles and to a loyal and loving companion who will never let this brave soldier forget that he is loved and appreciated.